Edward David Anderson performs Friday at the Castle Theatre. He also wanted those songs to harken back to a simpler time, when people could disagree, even politically, without damaging friendships. "Dog Days," "Best Part of Me," and the album's lead track “Harmony” reflect that idea. Anderson said “Harmony” came out of watching a Netflix documentary on the legendary Carter country music family. In this political climate, it’s understandable that every lyric is now dissected for a partisan meaning. The album’s title track deals with a gypsy lifestyle and the concept of home, something Anderson can speak to from years crisscrossing the country with his former band Backyard Tire Fire and now as a solo artist. Anderson said the song isn’t about him. Why write about him? Anderson said he was someone that used to play with him, and sensed the stories he told would eventually find their way into Anderson’s music. “We were shooting a video for ‘Fireflies’ (a song from Anderson’s previous album). My wife was shooting and was trying to capture an image of a butterfly landing on a wildflower out near Saybrook. It was windy out on the prairie and she couldn’t get the shot, and I said, ‘This is like chasing butterflies on the wind.’ And I said, ‘That’s a song.’ But it’s also a metaphor for my friend's life,” said Anderson. There’s so much to explore on this album. “Crosses” humanizes the “all the crosses by the side of the road” by reminding the listener they "were once people who will never get to grow old.” “Bad Tattoos” pokes fun at his inked up left arm. "The Ballad of Lemuel Penn" is a tough listen, and somewhat of a departure from other mostly upbeat songs on “Chasing Butterflies.” It’s a memorial of sorts to the 1964 murder of the decorated WWII veteran by members of the Ku Klux Klan. The July 11 killing was just nine days after passage of the Civil Rights Act. Anderson said he didn’t quite know why he wanted to write about Penn once he stumbled onto the story. “Is it my place to tell that story? I don’t know, because he’s got family out there. The song just flew right out of me, but I was wondering if it was my place to tell that story. Ultimately I decided it was. I’m just basically giving facts, you know, like this is what really happened,” said Anderson. Though he wrote the song in 2016, its release so near the conviction of Chicago police officer Jason Van Dyke for murdering 17-year-old LaQuan McDonald is difficult to ignore. “His name is Ernie, but for the last few years we just call him Bobby,” laughed Anderson. “Dog days for me are days you wish you could change places with your dog. And that happened to be one of those days. I think everyone has those days when you see this little guy sleeping on the sun and he just has no clue. And I’ve said this before, no offense to humanity, but I do prefer the company of canines to humans a lot of the time … they’re so innocent and don’t want to argue,” chuckled Anderson. 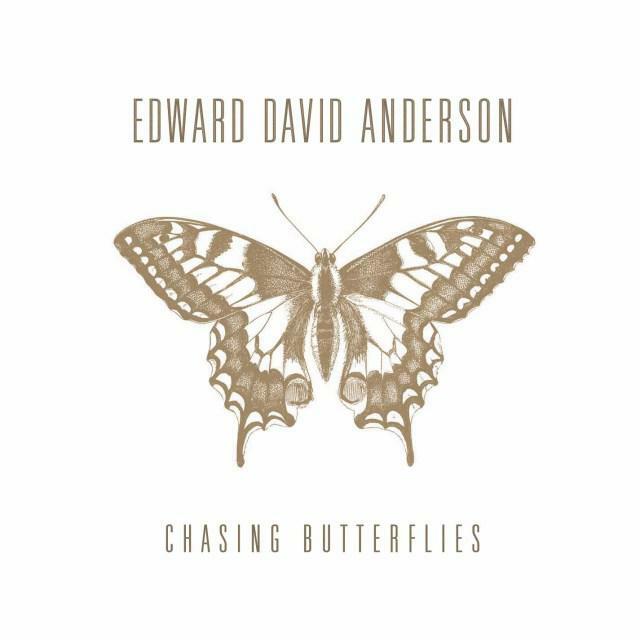 Edward David Anderson will play with a full band when he debuts “Chasing Butterflies” at the Castle Theatre in Bloomington on Friday, Oct. 19. The Bloomington rock 'n' bluegrass band Kickin’ & Pickin’ will open the show. Listen to an excerpt of the GLT interview with Edward David Anderson. Listen to the GLT interview with Edward David Anderson. Bluegrass legend Sam Bush included the original song “Bowling Green” on his latest album titled “Storyman.” It’s an ode to growing up on a farm just outside the southern Kentucky town.